Short version: it has many great properties and unique/rare substances. Long version: One of the rarest qualities that coconut oil has it the fact that it contains three types of acids that cause many of the benefits of coconut oil. These three types of acids are lauric, capric, and caprylic acid. Our body absorbs lauric acid easily and turns it into monolaurin (fun fact: it's also found in breast milk), which is antimicrobial, antibacterial, and antiviral. Capric acid is also antiviral and antimicrobial. In the body, it's turns into monocaprin and helps to fight against bacteria and viruses. Caprylic acid has even more benefits than the other two types of acid since it is anti-inflammatory, antiviral, antifungal, and antibacterial. It's great for digestion and reproductive organs. It's also the primary property of coconut oil that helps with acne! On top of all of these acids, other substances contained in coconut oil are Vitamin E (great for moisturizing), Vitamin K (helps absorb calcium), linoleic acid (anti-cancer properties), oleic acid (reduces blood pressure and helps your body burn fat), myristic acid (has cleansing properties), iron (eradicates fatigue and helps with anemia), and phenolic acid (has a "protective role" against heart problems and cancer). Last but not least, more than three quarters of the substances in coconut oil are also easily burned as fuel to keep your body energized. Phew! That was a whole lot of information! 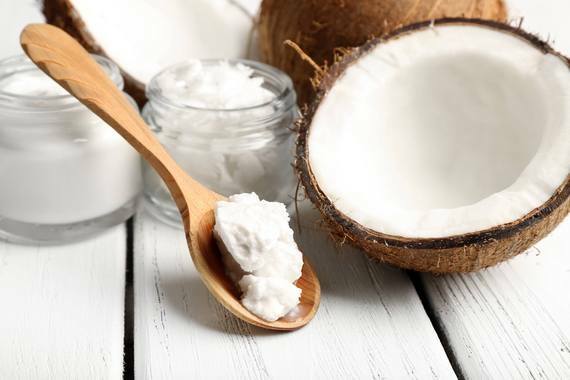 Now how can you take advantage of all these great nutrients found in coconut oil?! You've probably heard of many of the usual ways you can use coconut oil, like for dry cuticles, night cream, hair mask, but I want to introduce you to some new ways to incorporate coconut oil into your lifestyle. Curious about more ways to use coconut oil? You can find SO many ideas here! I'd love to hear how you use coconut oil in the comments below!